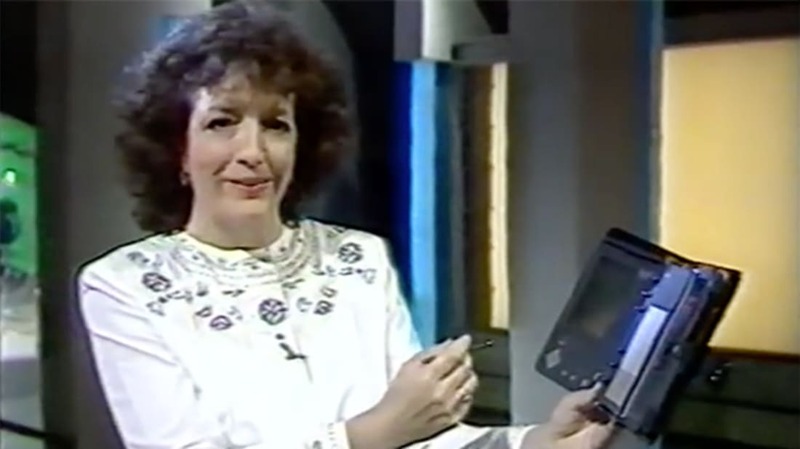 In this clip from a 1991 episode of Tomorrow's World we learn about a revolution in computing: A FREAKIN' TOUCH-SCREEN! Of course you don't actually touch it with your fingers, you use a stylus instead. And the screen is monochrome. And it's bulky. But still, you can kind of draw on it and that's a big deal. The early computers demonstrated in this clip struggle to do very basic handwriting recognition, but they do work. In a fascinating segment, they visit a Jaguar factory and note how the touchscreen is actually used in the wild, to ensure quality in paint jobs. "It's predicted that we will soon see an electronic checkbook which can read the amount, verify your signature, and communicate directly with the bank's computer." Not a bad prediction, though of course the checkbook itself was largely made obsolete by ATM cards. One of the computers shown appears to be a Kyocera Refalo KX-1601, which actually ran MS-DOS!